Losing his older brother to a war he’s never agreed with would have been bad enough for Connor Regan to live with, but for that hurt remain adrift with no understanding to anchor it is worse. Going on assignment with a SAS team that’s seen the worst the war has to offer—and to one of the most dangerous regions there is—seems like his best chance for some answers. What he finds will change him forever, and lead him to the first man Connor isn’t sure he can survive without. Sergeant Nathan Thompson isn’t a man with a lot of time on his hands. With one mission beginning almost before the previous one has ended, he can’t seem to find the hours to sleep, much less babysit a civilian reporter who’s managed to be embedded with his team. But, the “hack” gets under his skin faster than Nat ever imagined he would, and keeping Connor safe quickly becomes far more than just an obligation. Ordinarily, the speed with which Connor and Nat become attached would have concerned me. 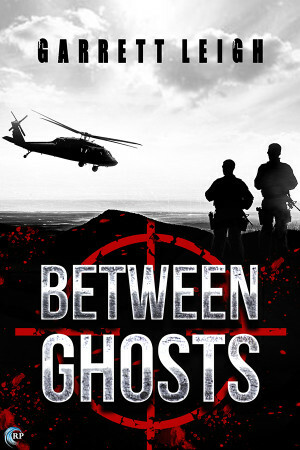 But, Between Ghosts is set in the middle of a never-ending war, and that, justifiably, made a huge difference. That a physical connection could be a balm in the midst of so much destruction, and that the heart might just as quickly follow—especially when time inherently must be counted so differently—I could easily accept. Ms. Leigh depicts the temporary nature of living through war very convincingly, making the relationship that evolves between the two men something worth cherishing, rather than dismissing. I found both Connor and Nat easy to believe in. Neither was very predictable, and accepting that their different personalities might be complimentary wasn’t a problem. At first, there seems to be little more to Nat than the gruff Sergeant whose responsibilities weigh so heavily on him. However, this proves not to be the case. Connor, in contrast, has plenty going on from the start, including his own, personal undertaking, and watching that mission disintegrate as his understanding of the situation increased made me feel as badly for him as I did for the soldiers he accompanied. Connor and Nat aren’t the only characters that stood out in Between Ghosts. It didn’t seem as if there were any negligible characters to me, each being imbued with such individuality and heartfelt connection to one another that I held my breath for them (and mourned some of them) just as much as I did for Nat and Connor. The fact that Connor built a strong association with all of them, and even provided an additional “bridge” between Nat and his own men, made them feel like a family. Filled with nail-biting ops, close calls, desperation, and loss, Between Ghosts certainly can’t be written off as mundane. From the horrible rations to the sad humor that colors Nat’s crew’s pilfering of desperately-needed supplies from other units, Ms. Leigh doesn’t go easy on her characters, or readers, for that matter. The unceasing threats they all face outside their base (and within it when the RPG’s hit their mark), the constant effort to keep their own supply line open, and the weight of a million things perpetually going wrong make for a sometimes difficult story. It felt important, though, so I read it twice. Between Ghosts is not light reading, but it does go by quickly. Amid so much darkness, it isn’t any wonder that the moments of incontestable passion between Nat and Connor glowed, at least to me, as they did. I found Nat and Connor to be remarkable characters, as are many of the others here, and Ms. Leigh made it nearly effortless for me to become lost in their collective tale. I always have a fondness for stories that make me think about things, and this most certainly did. I’m extremely pleased to have had the opportunity to read Between Ghosts, and it is absolutely one I’d like to keep. The publishers are giving away a $20 in Riptide credit. For a chance to enter, leave a comment, below. Entries close at midnight, Eastern time, on March 19, 2016. Contest is NOT restricted to U.S. Entries. Thanks for following the tour, and don’t forget to leave your contact info! This giveaway is sponsored by the publisher. Open to participants who are legally allowed to participate in such a contest as allowed by their local laws. All federal, state, local, and municipal laws and regulations apply. Void where prohibited. No purchase necessary. By participating in the contest, participants agree to be bound by the decisions of the contest sponsor. Prize will be delivered by the contest sponsor. This blog, its reviewers, and the owner are not responsible for items lost in the mail. By entering this giveaway, participants agree to abide by these terms. This sounds like a great story. I haven’t read many books about people in active military, several former military. A reporter traveling with a group at war would be an interesting story by itself, not mention the romance.